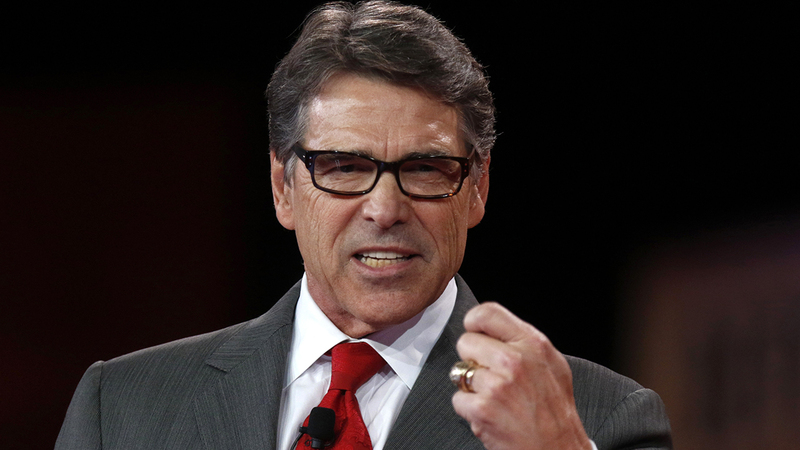 Former Texas Governor Rick Perry is dropping out of the race for the White House. WASHINGTON, D.C. (KTRK) -- Former Texas Gov. Rick Perry, tapped by President-elect Donald Trump to head the Energy Department, vowed to be an advocate for an agency he once pledged to eliminate and promised to rely on federal scientists, including those who work on climate change. Perry, who served 14 years at Texas governor, said he was for "all of the above" on energy production - oil and gas to renewable sources like wind and solar power - before President Barack Obama embraced the strategy. Perry also elicited laughs when he told Sen. Al Franken, D-Minn., that he enjoyed meeting him at Franken's Senate office, adding: "I hope you are as much fun on the dais as you were on the couch." Franken, a former comedian, paused for effect as Perry asked to rephrase. "Please," Franken said, "Please, oh lord." Moniz said last week that he and Perry had discussed the "special role" of the Energy Department's 17 national laboratories and said he trusts that the labs - and scientists generally - will have Perry's "strong support."